When the North Korean People’s Army (NKPA) crossed the border on June 25, 1950, its large, well-trained army steamrolled through the unprepared ROK forces, starting the Korean War. Believing that remaining neutral would be interpreted as weakness by the Soviets, President Harry Truman won the support of the United Nations for the defense of South Korea, assigning the military response to General Douglas MacArthur, commander of the American occupation forces in Japan. Nearly bankrupted by the massive expense of WWII, the American army had been allowed to decline, while reinforcements were sent piecemeal, so the NKPA had gained control of all of Korea by August except for a small perimeter around the port of Pusan. The NKPA had already burned itself out with repeated frontal attacks when an amphibious landing at Inchon caught the North Koreans completely by surprise. Seoul was recaptured on September 25, and the NKPA began to disintegrate. Deciding to reunify Korea by force, an overconfident MacArthur dismissed China’s warning that it would not permit American troops near the Yalu River, the border between China and North Korea. The entry of hundreds of thousands of Chinese ‘volunteers’ into Korea in late November transformed the war. After a series of Chinese offensives and American counter-offensives, the lines had stabilized near the 38th Parallel by mid-summer 1951. Using negotiations as a cover, the Chinese had fortified their lines, thus negating the American advantages of aerial and artillery superiority. The negotiations dragged on until mid-1953 because the Chinese and NKPA would not accept the right of Chinese and North Korean PoWs in UN custody to refuse repatriation to their home countries. Hoping to outlast the UN forces, the Chinese launched periodic attacks on parts of the line to test the UN Command’s will, including an attack against Pork Chop Hill. On the night of April 16, 1953, the Chinese infiltrated the defensive positions on Pork Chop Hill, which projected into Chinese lines, and quickly captured most of the hill. King Company, commanded by Lieutenant Joseph Clemons, Jr. (Peck), is assigned to relieve the troops defending the hill. A flanking attack by Love Company was intended to distract the enemy, but the Chinese are much stronger than expected, so King Company takes heavy casualties and Love Company is reduced to a small group of men. Despite their losses, the soldiers move up the hill and capture the whole trench system after fierce fighting. Although Clemons has a shadow of his original force, the men are exhausted, low on ammunition and under heavy enemy fire, he is not given the reinforcements needed to control the hill. Unknown to Clemons, the battalion is waiting for orders from division, which is waiting for corps, which is waiting for Eighth Army HQ. Realizing that the Chinese had attacked Pork Chop Hill as a simple test of will, not for any military value, the American negotiators at Panmunjon decide to reinforce Clemons. The Chinese lines are featureless, unlike the UN lines, where bunkers were built on top of hills. Although this is not explained in the movie, the UN lines had been hastily constructed after it became clear that the UN forces could not penetrate the Chinese lines. Bunkers were often placed on top of hills without sufficient foundation to bear intense artillery barrages, so a direct hit would often cause a bunker to collapse, killing whoever was inside. The Chinese method of simply digging into the hills was more time-consuming, but American artillerymen were generally unable to locate the Chinese guns, never mind target them. Morale is low and the men are looking forward to getting enough points to leave, which is a faithful presentation of the atmosphere at the time. The war was not popular, most soldiers did not identify with the Koreans they were defending and the troops knew that there was no possibility of total victory, just an endless stalemate. Operation Little Switch, the first small-scale prisoner exchange, had already started, fueling hopes that two years of negotiations would finally produce peace, so no one wanted to risk their lives when it seemed likely that the war would end soon. This lack of enthusiasm is acknowledged by the script when the screen battalion commander tells Clemons that his men are thinking of the war’s end, so he should push them up the hill fast. The first encounter between King and Love Companies occurred when the survivors of Love Company mistook the lead elements of King Company for Chinese and fired on them. Only twelve men from Love Company linked up with King Company, but they were the survivors from two platoons, not an entire company. Although it is a brilliant scene, the Chinese loudspeakers did not broadcast a greeting to King Company as it moved up the hill. The Chinese often welcomed arriving units by name to sow doubt among the enemy but not during a battle. However, the use of the Chinese broadcaster to explain the big picture was a good storytelling device. It is true that Major General Arthur Trudeau, the divisional commander, was unwilling to risk more men until he was assured that the hill would not be abandoned. Having seen companies take casualties defending other hills and then receive orders to abandon the hill to straighten out the UN lines, Trudeau was understandably unwilling to sacrifice more men in pointless fighting. While a number of minor changes had been made to produce a coherent narrative, the script’s main error is that Clemons makes a personal decision to hold the hill, rejecting the easier option of simply walking down to safety. In reality, the soldiers were literally trying to stay alive, and enemy artillery fire made moving down the hill almost as dangerous as fighting. The climatic screen battle is far more straightforward than the real one, since the fictional Clemons had positioned his men in a small perimeter, and bugles signal each Chinese attack against the perimeter. Actually, the Chinese used the rubble as camouflage to move between small pockets of American soldiers, so endless sniping and grenade attacks wore down the GIs. The Americans never had full control of any area and Clemons was trapped in the command bunker, cut off from his men. Despite altering the events to make a more conventional story, the script does capture the soldiers’ attitude. The men are openly scared and many have to be stopped from running back down the hill or using the excuse of helping the wounded down, which was a constant problem, especially during the night. Although his character is an invention, Woody Strode is convincing as a terrified soldier, who pretends to be hurt to avoid a fight, and does not want to die for Korea or the hell hole he grew up in back in the United States. A lengthy scene shows the negotiations at Panmunjon, where the American generals are patiently trying to talk to the Chinese generals who are sitting with bored contempt on their faces. 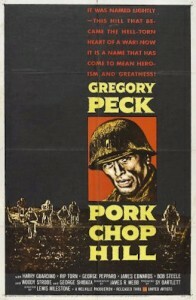 As the star, Peck’s character is aware from the beginning that the attack on Pork Chop Hill is simply an attempt by the Chinese to show that they are still a threat, while the American negotiators at Panmunjon only realize this at the end of the movie because they are played by supporting actors. 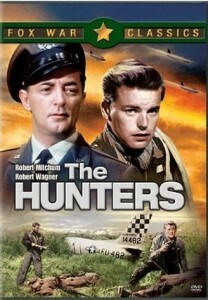 Aside from Peck, the cast was mainly made up of unknown actors, although many of them, including Martin Landau, Harry Guardino, George Peppard, Rip Torn, Robert Blake, Gavin MacLeod and Norman Fell, would become famous during the 1960s and 1970s. The cast benefited from having the actual platoon commander as a technical adviser, who trained them to act like soldiers, so the combat scenes are well-staged, easy to follow but harsh. The differences between the actual battle and the script was largely due to Peck’s demand for a role that reflected his status as a star. Peck and director Lewis Milestone disagreed over how Lieutenant Clemons should be portrayed. 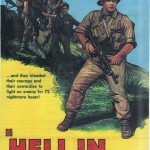 Since Clemons had just graduated from West Point and lacked combat experience, Milestone understandably wanted the character to be relatively unsure of himself but Peck was the producer and insisted on playing him in a heroic manner. The real Clemons was in his mid-twenties, so forty-three years-old Peck would have been better suited to play the battalion or regimental commander, whose role could have been fleshed out more. As a director-for-hire on the project, Milestone did not control the final editing, and was dissatisfied with the finished version, claiming that most of his movie had been cut out, leaving only Peck and a gun. 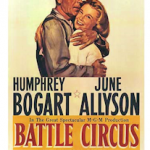 While the movie was overly melodramatic and Peck was unbelievably heroic, it is an honest look at the last stage of an unpopular war.